Happy Holidays 2016, and Thank You For These Gifts! I hope this 2016 Holiday Season finds each of you in good health and good spirits. During this time when the giving of gifts is traditional I find myself spending a great deal of time trying to understand, package, and wrap these gifts you will find enclosed that were actually sent to all of us 6 years ago from an unknown sender – like Santa Claus, but in real life! I want to open 2 of these gifts with you. Through them we can all realize some measure of the joy, the hope, and the wonder that we all associate with this Holiday Season. I believe that was the original sender’s true intention. We do not know the original senders of these gifts. We know that, whoever they are, they are as brilliant as they are interesting, to say the least. They give away these gifts to all of us in the crop fields each summer, freely, anonymously, in abundance, and with what seems to be the best of intentions. We call these gifts “Crop Circles”, and I believe that today and every day we can all find them useful in our lives. We can be certain that they have been sent to all of us for a good reason, although even today that reason remains obscure. Please join me as we open our gifts together. 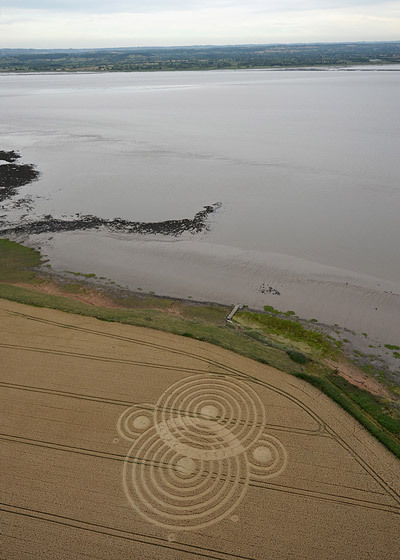 Our first gift, this crop circle shown above, was discovered at Woolaston Grange, Gloucestershire, UK on July 18, 2010. It was first reported by a man who saw it from the window of a train as he went by this crop field of mature wheat. If we draw a line through the long axis of this formation and extend it across the River Severn to the opposite bank 2.5 miles away, that line will directly intersect the Oldbury nuclear power plant. Both reactors of this plant were shut down in 2011, about 1 year after this crop circle appeared. They were shut down after an accident occurred during which a large plume of radioactive steam was emitted from the reactor. Luckily, the reactors did not sustain a total “meltdown” as has happened in both Russia and Japan. In addition to venting steam, this nuclear accident released some small but detectable amounts of radioactive elements into the surrounding area – polonium, actinium, and beryllium, as assessed and reported by the facility’s operator, Magnox, Ltd.
A prominent feature of this crop circle is what appears to be a “convex lens”, like a magnifying glass or a telescope, created by the overlapping of the 2 larger 6-ring circles. The “lens” appears to have “light waves” passing through it and, if you look closely, those “light waves” seem to be passing through the “lens” in one direction only – toward an observer’s eye looking through this “lens” and toward the Oldbury nuclear power plant. The “lens” seems to be focusing our attention on the nuclear power plant. The 2 overlapping 6 ring circles that create the “lens” also have meaning. In fact, everything about this crop circle has meaning. 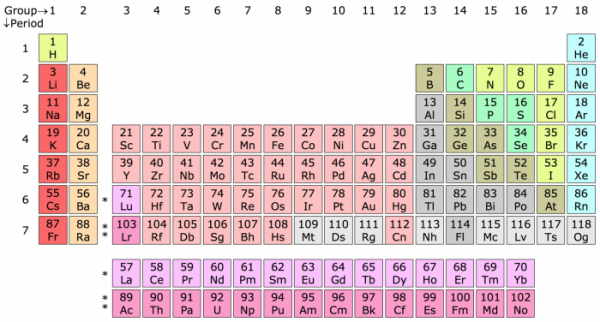 Take a look at the periodic table of the elements shown here. It has rows and columns. With each new row (called a period) across, those elements have gained 1 additional electron shell. There are 6 rings in the larger circles, and this corresponds to the period 6 row of the periodic table. This 6th period contains several radioactive elements, and polonium (atomic number 84) is one! Notice the 2 small “dot” circles closely associated with the larger, 6-ring circle. Those represent alpha (α) particles, characteristic of polonium’s radioactive decay. Now, take a look at the 2-ring “element” of the formation. Moving to period 2 of the periodic table we find beryllium (atomic number 4), also a radioactive element and also one of the elements released during the steam venting accident that occurred at the Oldbury nuclear facility one year after this crop circle appeared! The small “dot” circle closely associated with the 2-ring (beryllium) circles represents a beta (β) particle, characteristic of beryllium’s radioactive decay. I think you will agree that a crop circle that appears to give us a “heads up” warning about an impending nuclear accident is a great gift! If we consider what happened in 1986 at Chernobyl, today we see that an area extending 30 km in every direction surrounding Chernobyl was rendered uninhabitable for the next 20,000 years! Imagine if this had happened in a country the size of England! There’s another gift I want to open with you this Christmas that was sent to all of us on July 27, 2010. Somehow it got lost but I recently re-discovered it, and I am now sharing it with all of you – for it was originally intended for all of us! 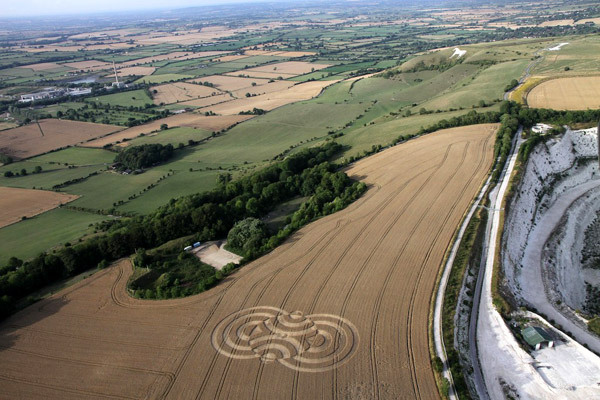 If we draw a line through the long axis of this crop circle you can see that the line would quickly intersect the nearby chalk (calcium carbonate, Ca2CO3) quarry. Below is another photo of our gift. You will be better able to understand what follows from this overhead perspective. First, consider this scale-model of a water molecule, H2O. Can you see the water molecule overlying the 2 larger, 3-ring circles? It is oriented differently than the water molecule model shown above, but it is otherwise the same. Because water is clear (transparent to light) we can see right through the water molecule and into the chemical reaction that is happening in conjunction with it. Is that cool, or what? Now, about those ringed elements of this crop circle. Because this formation was created so nearby to the chalk quarry and pointing right at it, these 3 ring circles seem to reference Ca2CO3, the material that is being mined from this quarry. After all, Ca2CO3 is composed of three elements – calcium, carbon, and oxygen. So, what we are seeing is an extremely clever representation of a chemical reaction between Ca2CO3 and H2O. One of the products of that reaction is something we hear a great deal about these days – CO2 (carbon dioxide, thought to be responsible for Global Climate Change). 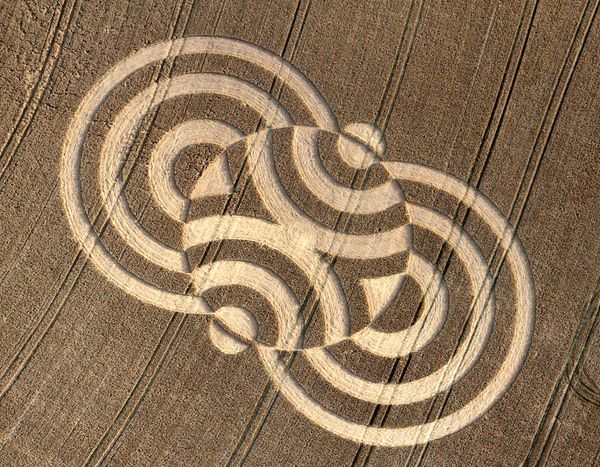 Do you see that actually 4 molecules of Ca2CO3 are featured in the design of this crop circle, rather than just the 2 that are most obvious? The other 2 are shown rotated 90 degrees from the 2 more prominent ones, and we actually see them in the process of combining in a chemical reaction! Wow! Those who designed and created our gift seem to be really gifted artists themselves, wouldn’t you say? Just coming up with such a design is remarkable. But to then be able to place the design, large scale, in a field of wheat, at night, undetected, no mistakes, in all kinds of weather, while potentially risking arrest for trespassing and vandalizing a farmer’s field of wheat, and for no payment or even recognition seems, well, almost supernatural. Remember – by 2016 and over the past 40 years this has been accomplished thousands of times! If made by humans, one has to wonder – where would they practice these techniques? Is our gift one that is intended to draw attention to CO2, and possibly some connection between that and a Ca2CO3 quarry? Well, if we consider that Ca2CO3 is the major component of cement and that our world’s manufacturing of cement produces 5% of mankind’s total global CO2 emissions each year, then perhaps that important relationship is what we are being reminded of here. It’s your gift too, so you decide. I Hope You Like These Gifts! Although I am sharing these gifts with you, we must keep in mind that they were clearly intended for all of us, all of mankind – given freely and with no strings attached. Yet, we never remember to say “thank you”, and few take much notice of these remarkable gifts that can, if we will allow them to, bring to each of us some measure of joy, hope, and wonder throughout the year. Those who created these gifts, whoever they are, have given us thousands of similar gifts, ones just as thoughtful and just as beautiful, year after year, for now almost 40 years. They never skip out, they never ask for money, they do not seek fame, and they have chosen to remain entirely anonymous. We do not hear about them in the news. If they are persons like you and I, human or otherwise, then they are unbelievably clever in the beauty and balance of their designs, their skill in the placement of these designs in the crop fields, and the depth and importance of the information they often convey. We can sense that each design manifests an appreciation of beauty and seems to be motivated by kindness and concern – concern for the well-being of mankind and this Earth we inhabit. And that is what this Holiday Season is all about! So Happy Holidays to all of you! Please feel free to share these gifts with others! CEO of Crop Circles Research Foundation, Inc., a 501(c)(3) nonprofit based in Clancy, MT, sponsor of The Jesse A. Marcel Library. P.S. : I extend my deepest gratitude and best Holiday Wishes to Dr. Jerry Kroth, Ph.D., who is responsible for realizing many of the insights described in these crop circles, to John Montgomery and Charles Bolden who took the aerial photos of Beggar’s Knoll, to Olivier Morel who took the aerial photos of Woolaston Grange, and to the Crop Circle Connector website that continues to make this important information available to the general public. You guys rock! Thanks, Richard. Truly remarkable. A gift indeed. Thank you for your sharing and many gifts! Thank you for sharing these. Truly they are beautiful gifts! Thanks Richard for a positive enlightening post. Merry Christmas! What lovely Christmas gifts to open and ponder! Since these were both discovered in July of 2010, perhaps their message to us is indeed combining to let us hope and pray for solutions that are sustainable in this World. They used beauty to point out the ugly of our slow and awkward ‘progress’. May we all take heart that these unexplainable gifts in our current paradigm will inspire us to seek higher meaning in life and logic. Just wondering if anyone performed a forensic inspection of these sites? Radioactivity? Plant nodal and seed analysis? I don’t know. Nancy Talbott is the only person I know of who might know the answer to your question. These gifts are wonderful. Thank you for sharing.